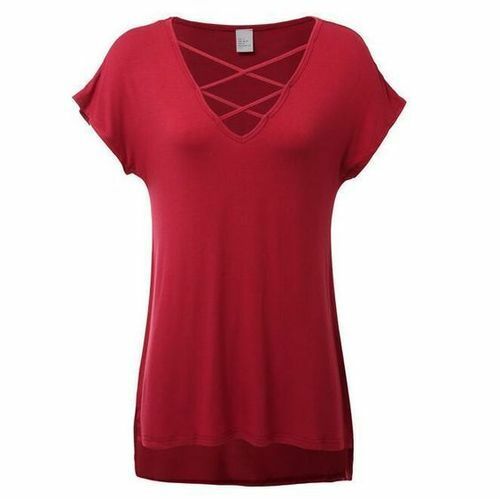 Our organization is counted as one of the distinguished names, involved in offering exclusive collection of Women's Plain T-Shirts. These are designed by using advanced machines and premium quality fabrics in strict compliance with defined industry standards. These t-shirts are available at industry leading prices. Established in the year of 1995, Chiller Fashion has scaled the remarkable height of success and growth by efficiently meeting the competition as well as challenges posed by the industry. Our company is engaged in manufacturing, exporting and supplying an exclusive range of Kids Wear, Men's T-Shirts, Men's Hoodies, Women's T-Shirts, Women's Tops and Women's Wear. Our products range includes Men's Polo T-Shirts, Men's Plain T-Shirts, Kids Collar T-Shirts, Kids Frocks, Women's Printed T-Shirts, Women's Night Suits, Women's Hoodies, Women's Shorts and more. We always stay focused towards the design and quality of the fabric used to manufacture these products, in order to serve our customers in most appropriate and best possible manner. We need more queries from European & American Countries. Apart from this, our complete range is designed under the stringent guidance of skilled designers and quality controllers, who ascertain unique patterns and incredible finishes. Our products are widely acknowledged in market for their beautiful texture, high comfort, eye-catchy colors, fine finishes and many others. This is just because of our outstanding collection, ethical business practices, fair dealings and cost effective solutions that, we have achieved a remarkable position in this competitive industry.